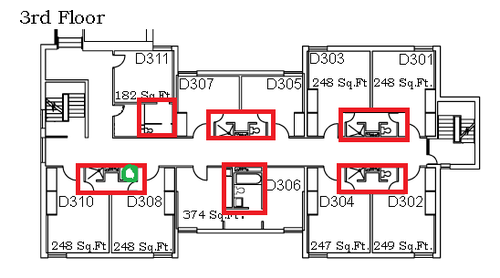 Hello, I recently received my room assignment (BARH–room D310) and am wondering why the rooms on the bottom-left of the floor plans on the 2nd, 3rd, and 4th floors have no toilet. Is there some mistake on the plans? If not, what bathroom is supposed to be used? From my understanding, you are talking about your own room. The toilet was left out of the blueprint (which is not meant to be comprehensive). I’m am certain that you have a toilet. I marked it in green below. Bathrooms are all in red. ← Could you post pictures of Bryckwyck apartments?